Hachiko Reunited with his human! In a span of 90 years, the loyalty of a dog from a sleepy town in Japan, has traversed from Shibuya via newspapers, reached Tokyo and neighboring islands via textbooks and animated films and further across the oceans via a Hollywood adaptation; it would hardly come as a surprise if we find in an internet survey that Hachiko is the world’s most famous dog. Finally Hachiko reunited with his human, in a bronze statue installed on his 80th death anniversary, at the University of Tokyo where Hachiko’s human Hidesaburo Ueno (1871-1925), a professor of agricultural engineering. once taught. 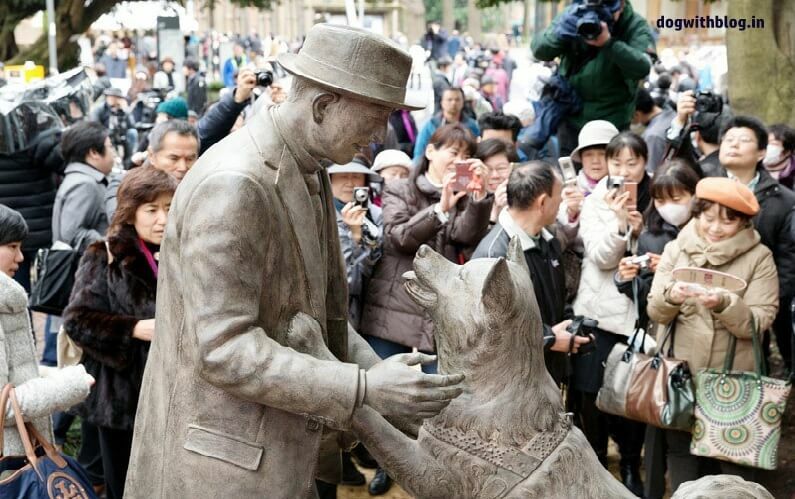 The statue depicts Hachiko jumping up to greet Ueno, who is extending his hand to pat the dog. Hachiko died of the filarial disease in 1935, 10 years after Ueno’s death. All through these years, Hachiko religiously kept coming, each day without fail, to the railway station, waiting for Ueno to return from college. …and he waited his entire life for someone who couldn’t come home. In commemoration of the daily vigil, a lone statue of Hachiko was erected in front of Shibuya Station in 1934, even while the canine was still alive. In an another realm, Ueno and Hachiko reunited, must be looking down at the statue with a smile. Here are 10 more dogs who waited for their human love(s). Posted on April 1, 2015 September 6, 2017 Author Abhishek JoshiCategories Hail the hound! Sooo brilliant and touching…. sooo happy that Hachika got renuited with his human. He deserved this at the least…. Superb! I just saw the movie a few months back… and this post has brought such welcome news! 🙂 thanks for sharing! Thanks Archana, glad to know that this news fills you with that unbridled delight 🙂 In Hachiko, we trust! Next Next post: What You Need to Know about Game of Thrones Direwolves?